Twitter can be a great tool for keeping up to date with your favorite person/company/band/etc. You can find a Twitter client for just about anything that plugs in these days, but sometimes we find that we simply need a break from our computers and smart phones – even if just for a few minutes. What happens when you want to unplug, but still need to know what everyone is up to? [Patrick Dinnen] asked himself the same thing, and decided that the solution was a mechanical Twitter feed display. 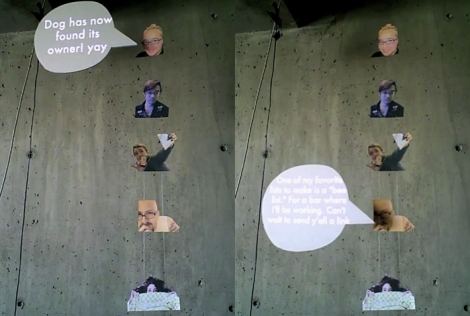 The display consists of a static user list strung up against the wall, with a mobile speech bubble mounted next to it. The bubble moves to the user who has most recently updated their status (presumably using a pair of servos), and uses a projector to display their messages. The effect is pretty neat, and it still allows you to get your Twitter fix without staring blankly at your computer screen or smart phone. We think it would be even cooler if it used a projector on both sides, enabling it to dynamically shuffle through users and status messages at the same time. [Patrick] says that for right now it is merely a proof of concept, so there is no telling how he’ll tweak it going forward. Continue reading to see his mechanical Twitter feed in action. Maybe the speech bubble could use epaper. It would add complexity to driving it, but maybe it would be cheaper in the long run. i fail to see how this gets you away from the computer and twitter. great hack, but just isn’t what its supposed to be. in a world where twitter and facebook invades your myspace, it’s hard to unplug yourself. A real mechanical twitter feed would be one of those old Stock ticker tapes from the 20’s click away spewing the inane tweets…. Or they could just grow up and get the hell off of Twitter…it’s stupid and pointless. Wow, and I thought the toy car “switch” was dumb. How would using a projector be different than looking at it on a screen….? Oh yeah, it would go out after 1000-2000hrs. who cares if you think twitter is dumb! what do you think of the project he made? The fact that he used a projector to display the message (they’re called tweets, right?) seems to belie the whole point of it being a “mechanical Twitter feed”. When I saw “mechanical”, I thought that perhaps he had a printer hooked up that would print out the message and then move it into position. Maybe an old dot matrix printer would be suitable, as it would add the classic “kersh-kehhh-kehh-kersh” sounds. A typewriter bell would make the ultimate “receive” sound. Overall though, I think the project is intriguing, just needs more vintage appeal.